Ulike typical Energy Performance Contracts, our Energy Reduction solutions typically return the investment in 1-3 years. 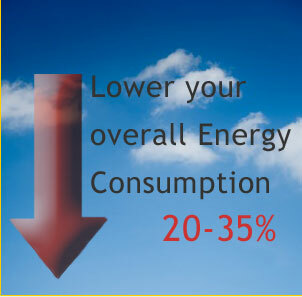 Our goal is to shed significant energy consumption and reduce utility bills by 20+%. Utility company rebates are helping to pay for as much as 1/2 the cost of energy upgrades. Federal EPAct 2005 Tax Incentive - pays you up to $1.60/sq. ft. of your facility for certain energy reducing upgrades. A significant portion of an energy reduction investment is being covered by the incentives listed above. We've listed options below to effortlessly implement energy solutions. We are currently working with Michigan Saves and private investors to provide true shared savings programs. These programs offer little or no up front cost, and no capital investment by the host or receiving company. The cost of the products and installation are rolled into a lease finance over a structured periord of time. The monthly outlay of funds fits into your existing line item for Energy of Utility bills and can be structured to create positive monthly cashflow. Reduce overall energy consumption for the life of the facility, our solutions payback quickly without the upfront expense. Continue on with a similar Solar and Wind Power Purchase Agreement (SWPPA) immdiately following the first upgrade, allowing for a much smaller power generation system needed. Generate a portion or all of your electric needs.